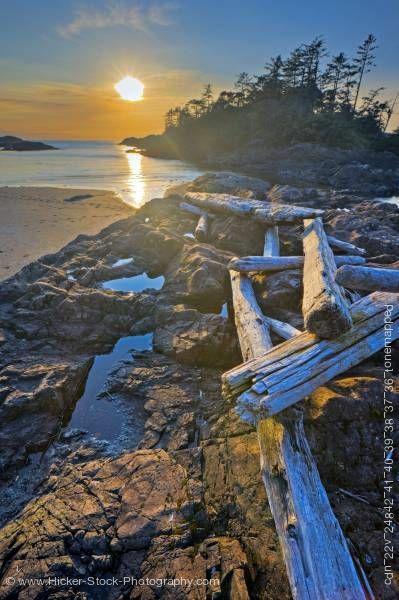 This stock photo shows driftwood strewn over a rocky outcrop along South Beach at sunset in Pacific Rim National Park, Long Beach Unit, Clayoquot Sound UNESCO Biosphere Reserve, West Coast, Pacific Ocean, Vancouver Island, British Columbia, Canada. Backed by the Insular Mountains Range of Vancouver Island and facing the open Pacific Ocean, Pacific Rim presents the rich natural and cultural heritage of Canada's west coast. Its cool and wet maritime climate produces an abundance of life in the water and on land. Lush coastal temperate rainforest gives way to bountiful and diverse intertidal and subtidal areas. Long Beach is considered the largest sand and beach setting on Vancouver Island, by many locals in the area. The different portions of the Long Beach section are referred to by the locals as Wickaninnish Beach, Combers Beach, Florencia Bay and Long Beach. Some of the hiking and walking trails located in the Long Beach section of the Pacific Rim National Park are the Willowbrae, South Beach, Nuu-chah-nulth, Rainforest, Spruce Fringe, and Schooner Beach Trails.